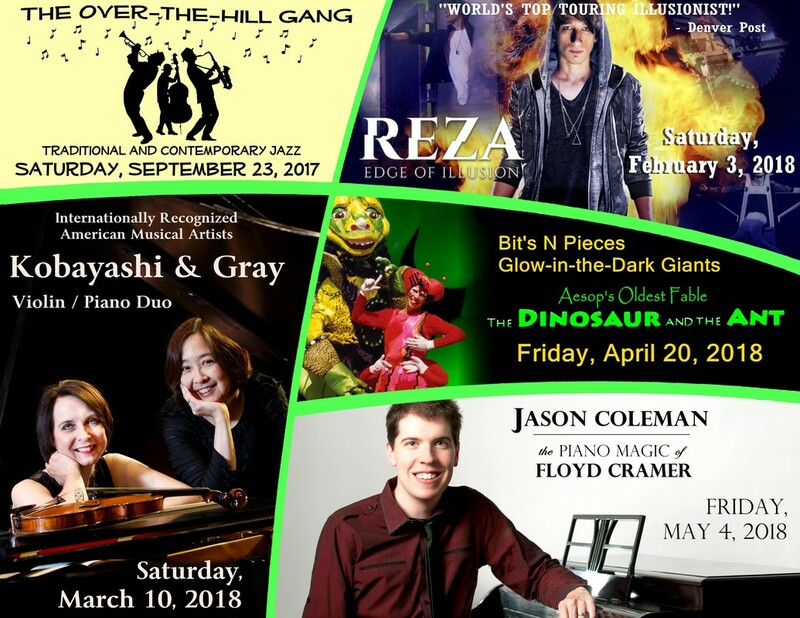 For quality, affordable and fun live entertainment close to home, one only needs to visit The Ritz on Main Street in Blytheville during The Arts Council of Mississippi County’s 2017-2018 Series. Five fantastic shows are already planned, with additional programs and events under consideration. The Series opens Saturday, September 23, 2017, with a toe-tapping evening of jazz. “The Over-the-Hill Gang” is a seven-piece band specializing in historic and contemporary jazz. Each member adds a particular quality to the mix with their unique clarinet, trombone, piano, trumpet, string bass, drums and vocal talents. “The Over-the-Hill Gang’s” contagious energy will transport you back in time as you enjoy many Big-Band era tunes. In October, we will break for our annual “Haunted Theater” fundraiser event that is sure to spook even the bravest patron. That will be followed, of course, by the holiday season, featuring our Holiday Open House on stage in December. The next Series event will be on Saturday, February 3, 2018, when we welcome back to The Ritz one of today's most highly sought-after entertainers in the touring illusion industry, “REZA: Illusionist.” REZA will amaze the audience with his magic and illusions and leave them scratching their heads in wonder at his amazing performance. He is sure to thrill and confuse even the greatest skeptic. On Saturday, March 10, 2018, we will host a fantastic piano and violin duo. The Kobayashi/Gray Duo will present an evening of great music highlighting many contributions of female composers. These ladies perform with a unique passion and fire as they share this great music. Be prepared for an extremely high-energy evening of music like you have never heard before. Friday, April 20, 2018, we will again welcome the giant puppets to our stage for their production of “Aesop’s Fable: The Dinosaur and the Ant.” This production will bring Aesop’s oldest story to life in new and interesting ways to be enjoyed by all ages. This is a great, fun show to share with family and friends. Friday, May 4, 2018, we will feature a young musician named Jason Coleman. Jason is the grandson of piano legend Floyd Cramer, and he will present his tribute program entitled “The Piano Magic of Floyd Cramer.” Jason has mastered his granddad’s style of slip-note playing and will share many stories and experiences to bring the Floyd Cramer experience to life. You will learn about the many contributions Floyd Cramer made to American popular music as a composer and a session musician, in addition to his own solo career. A great way to be sure you get in on all the fun is to become a Patron or Corporate Sponsor of The Arts Council of Mississippi County. Patrons and Sponsors have their personalized tickets for each show mailed to them about two weeks before each event. They also receive many other special benefits and perks throughout the Series year. As always, children twelve and under are admitted free to Arts Council Series Events with a ticketed adult. Patrons and Sponsors are encouraged to pass their tickets to someone else if they are unable to attend a specific event. For detailed information you may stop by The Ritz weekdays from 9:00 AM to 5:00 PM, email us at www.artsmissco@yahoo.com, or simply call (870) 762-1744. *Children twelve (12) and under are admitted free to all Series programs with an adult.